- When a recipe calls for chopped herbs, consider grinding instead. 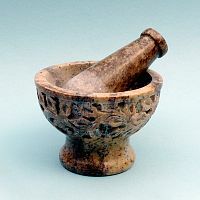 Using a mortar and pestle to prepare the herbs will release their maximum flavor into your cooking. 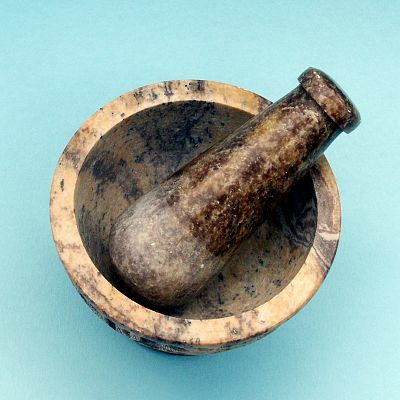 This tool is also useful for preparing herbal ointments or incense. We recommend using one set in the kitchen, and another for any non-edible applications. Carved vines and leaves form a wide border around the bowl of this unusual mortar. It stands 3" high, with a bowl 4" across. 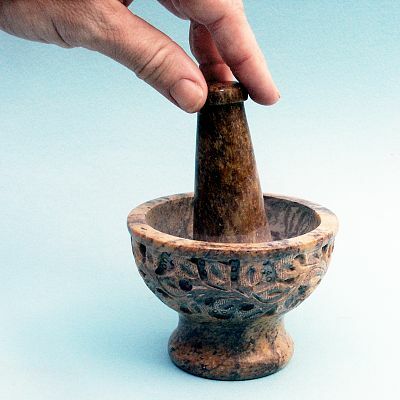 Do you have any other questions about our Carved Leaves Mortar and Pestle? I am very Happy with mine I do think u can find a nice one anywhere. The caveing is done wonderfuly. This mortar and pestle have the right size to work with your herbs for your own incense. It is beautifully carved and feels good to handle.